Little Swamp Creek: What happens when a 400,000-gallon stormwater detention vault gets emptied into a wetland? What happens when a 400,000-gallon stormwater detention vault gets emptied into a wetland? Well, this is what it looked like in our yard, eight-blocks downstream. 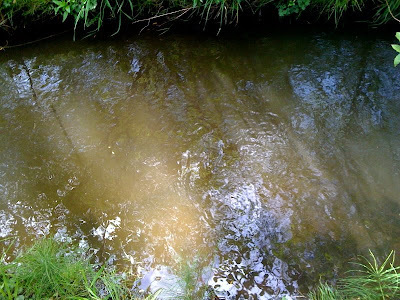 Eric was went outside this afternoon and was surprised to see that the stream was silty and running higher than normal. As if we had just had a rainstorm. But we hadn't. I wondered if there was a problem at the Brightwater tunneling/portal site, since their groundwater drains to the stream, so I grabbed the camera and went over there to check it out. But the silty water was coming from further upstream. Continuing up 80th, I could see a lot of water flowing down the west side of 80th and into the stream at the point where the stream pops out from flowing under 80th from the east. This cross-under happens just a little ways south of the entrance to the Kenmore Estates development at 198th and 80th. The water that enters that stormwater drain comes out on the other side of 198th. The flow in the previous picture. This is when I realize that I would be a TERRIBLE investigative reporter, because I started to freak out a little bit and no longer took good pictures! I know where the water is in that shot, but I'm sure you can't tell! I blasted up to where these guys were working. They were pumping out this underground retention vault. I explained to them what effect they were having on the stream, but they insisted that the water they were pumping out was clean and that they had a permit to pump the tank out for an inspection. They didn't realize that the water was flowing into a stream, but still insisted that it was clean ground water, so it doesn't matter. They apparently weren't going to stop just because a crazy woman was telling them that they needed to. It may have been "clean" ground water, but the rate at which it was flowing was sure stirring up a LOT of sediment in the stream. I figured that my first call would be to the city of Kenmore, and then the Department of Ecology. Luckily I got a hold of someone at the city who verified that these guys do have a permit to pump into a vegetated area, IF the area can take the flow. He drove up to check it out in person. But what do you know! they had stopped for the day. How handy. Lucky for the stream, he took my word for it and told them that when they finish the job tomorrow they will need to use smaller pumps and pump into a different part of the wetland area or pump into the sanitary sewer. Meanwhile I did go back up there with Eric and a friend of ours and talked to the guys. I was ready to show them pictures of the turbidity of the stream in our yard. They seemed to understand the need to slow down the flow rate tomorrow, though it sounds like there's not much left to pump out. In the end, I believe that there are a few things that need to change so this doesn't happen in all of the developments around here. First of all, if these retention vaults need to be pumped out periodically in order to be inspected, then there obviously needs to be a little regulation of the rate of outflow as part of the permitting process! It is amazing to see the impact that this flow had on the stream, not only in turbidity but also in that it raised the stream level by a couple of inches. The second frustrating issue is the fact that not many people realize that Little Swamp Creek flows along 80th between approximately 198th and halfway between 195th and 192nd. It is hidden in the reed canary grass. There used to be a sign along there somewhere that said "This stream is in your care", but it was knocked down and never replaced. We'll have to see what we can do about that. They had stopped there pumping at least 45 minutes earlier. If this is a salmon stream, I wouldn't think the major deposition of silt would be good, since even if it isn't the time of year for salmon eggs to be present, it would clog up the places where they will eventually be deposited and fertilized. I would also think stormwater contains gas and oil from roadways, which is not any better for wetlands than for the Gulf of Mexico. Part of the purpose for retention ponds is for the oil to evaporate and/or be broken down by bacteria. Pumping it into a stream defeats the whole purpose.